Introductory Set � Ten 5 ml (.17 oz) tubes, including New Gamboge, Cadmium Scarlet, Alizarin Crimson, Winsor Blue, Winsor Green, Yellow Ochre, Light Red, Raw Sienna, Lamp Black, and Burnt Umber. The set is packaged in an attractive cardboard box. Artists' Field Box Set � This compact, pocket-sized field box unfolds into a palm-size kit with two palettes for mixing, a water container, a water bottle, a sponge, and a folding travel brush. It includes 12 colors in half-pans: Cadmium Yellow Pale, Winsor Yellow, Winsor Red, Permanent Alizarin Crimson, French Ultramarine, Winsor Blue, Winsor Green, Yellow Ochre, Burnt Sienna, Raw Umber, Ivory Black, and Chinese White. 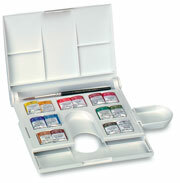 Artists' Watercolor Compact Set � Perfect for the traveling watercolorist, this folding plastic palette contains 14 half pans of Winsor's finest Artists' Watercolors and a pocket size sable brush. Folded, it measures just 4�" � 5�" (11 cm � 13.5 cm).